Costume dramas aren’t all made equal! When my friends recommend movies to me and say “it’s a costume drama, you’ll love it” I have to bite my tongue because they’re not all gems. I was a bit hesitant to watch the works of producing duo Merchant/Ivory because, oddly enough, most of my friends who love costume dramas don’t seem to enjoy their work. Words like “dry,” “long,” and “boring” get tossed around a lot in reference to Merchant/Ivory. Either way I decided to watch it…and loved it! Sure the movie’s a taste stuffy but the story is grand, the characters are far less annoying than in other movies, and it’s a beautiful film! Young Lucy Honeychurch (Helena Bonham Carter) goes to Italy with her older cousin Charlotte (Maggie Smith). When Charlotte spies Lucy and George Emerson (Julian Sands) in an embrace, the first instinct is to get Lucy to never tell anyone. Forcing Lucy into a hasty marriage with the dry Cecil (Daniel Day-Lewis), Lucy must fight against her love for George. I think what I enjoyed the most about this movie is that it’s not all pining and “woe is me” like other movies. I love Jane Austen adaptations, and the numerous versions of the Bronte sisters work includes some of my favorite movies, but they can be melodramatic and overbearing. A Room with a View is also based on a classic work of literature, but the beautiful Italian landscapes and the overall effervescence of the cast makes the film feel…more cheerful I guess is the word I’m looking for. All the characters have their quirks that end up holding them back throughout the movie. Lucy is deathly afraid of her mother, Charlotte fears Lucy’s love for George as she’s been wronged in the past, while George comes off as incredibly cheesy with his philosophical nature. The entire movie shows the parallels between the younger generation (Lucy, George) and their relationship with their parents. Most of the “classics” involve orphans or other lonely youth but here you see some semblance of normality at the times between the parents and their children. The acting in these movies is generally what elevates them. I’m not a fan of Helena Bonham Carter. She seems to suffer from “Johnny Depp Syndrome” in that she generally doesn’t play characters nowadays that aren’t layered in makeup or a funny accent. Here, in her big-screen debut, her Lucy is sweet without being stuffy. Maggie Smith and Judi Dench are hilarious as the typical blustery old ladies in movies like this. Daniel Day-Lewis is practically unrecognizable as the stuffy and bland Cecil. For me though this film was all about Julian Sands. The man is so good looking in this movie it should be a crime and he plays such a sweetheart. The movie was a critical success and an Academy Awards darling. 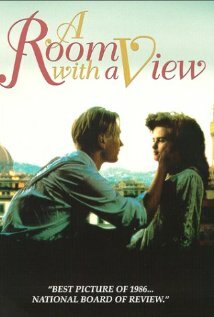 A Room with a View is funny, romantic, and a sweeping story! Excellent! This has been on my queue for some time now, and you’ve pushed me over the edge to watch it! It’s not my favorite costume drama but it’s definitely worth seeing! Have you ever seen the costume drama, “The Tudors”? It is one of the best costume drama that I have ever seen.. Although, it is very violent..
I’m not sure if you read my review on Elizabeth but I’m a huge Tudors history buff and devoured the Tudors heartily. Yes it’s violent and highly sexual but hey, it’s Henry VIII lol. Thanks for reading! Awesome!! I will look for review on Elizabeth..
One of my favorites! I did not recognize Daniel-Day Lewis at all. In my opinion the best Merchant Ivory film. It made me want to watch every movie that had Julian Sands and HBC.